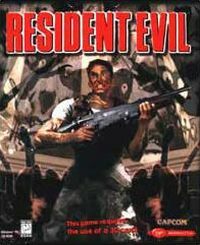 Resident Evil is an action adventure game that puts emphasis on horror atmosphere. Terrifying events start to occur in the town of Raccoon. Reports say that bloodthirsty monsters prowl the streets and murder people. A special unit called S.T.A.R.S is sent to investigate. As it turns out, a virus devised by a mysterious company Umbrella turned every citizen into a zombie. The player assumes the role of one of the S.T.A.R.S operative and his main goal is to survive this nightmare. There are two characters to choose from: Chris Redfield and Jill Valentine. Both have slightly different storylines and different starting equipment. The most important part of the plot takes place in a lab accessed from an abandoned house somewhere on a desert. There are lots of weapons available at our disposal, starting with a knife and ending with a rocket launcher. The items we find are stored in our backpack, which enables us to use them at will. We are also accompanied by thematically-appropriate soundtrack that deepens the atmosphere of uncertainty and horror.